Today I’ve submitted a new story to its first market. My complimentary rejection will probably arrive within the next few weeks. This is my first new submission in close to a year, so it’s a little daunting. Right now I have 3 total stories in submissions. Two are science-fiction and this new one is best categorized as horror. It’s very loosely based on an experience I had when I was a kid that still gives me the heebs-n-jeebs. Hopefully, my recreation of it will do the same for the editors. 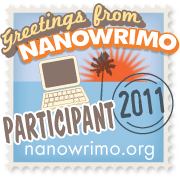 This entry was posted in Announcements and News and tagged fiction, horror, sci-fi, short stories, writing. Bookmark the permalink. Good luck Shedrick — sending out something new can be more scary than any horror story. Hope it turns out well for you! Good luck! What kind of story is it?